Cyril Ramaphosa ANC Deputy President - And Now Comrades? 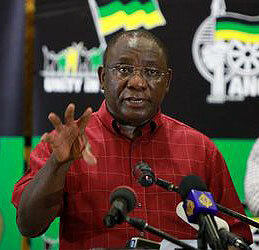 Cyril Ramaphosa ascends to the high position of Deputy President of the African National Congress. What does this mean for the direction the ANC is headed in the build-up to the 2014 National Elections? Cyril Ramaphosa received 3,018 votes from party delegates, while incumbent party leader and President of South Africa Jacob Zuma was re-elected with 2,983 votes. The vote totals indicate that Ramaphosa, for the moment, is the most popular political figure in the ruling ANC. From his humble beginnings as a trade unionist, Cyril Ramaphosa left politics in January 1997 to pursue a career in business. By all accounts his career in business has been one of achievement and success; his personal wealth is now estimated at over R600M. Cyril Ramaphosa's decision to exit politics to delve into the business world stands out from the typical African politician/businessman who more commonly remain in politics while using their office to help feather their nests. His career has so far been untainted by the corruption and scandal that has surrounded so many high and low ranking ANC officials and black businessmen in South Africa since 1994. The End of ANC Socialism? Does appointing a billionaire businessman to position of party deputy president indicate the ANC is on a path to abandon any pretencse at being a political party with neo-socialist intentions? Hard line socialists in the ANC have recently been second lined, or even expelled from the organisation, as in the case of Julius Malema a few months ago. Part rhetoric has been very low-key on the socialist front in recent times. Has the ANC finally abandoned the long stated ideals of a socialist society in favour of a more westernised approach to governance? If so, where does this leave the party in the head up to the next general elections in 2014? Their support base is still largely from poorer black South Africans who want more social support from government. Has the increasing support given to the Democratic Alliance in the last municipal elections and since shown the ANC it's time to change. Without doubt the ANC will not receive the overwhelming majority it got in 2009. Even a drop of 5% of total vote will be indicative of the dissatisfaction of many (black) voters who supported the ANC simply because of it's history of the liberation struggle. Is the appointment of Cyril Ramaphosa an indication the ANC is desperate to overcome it's current image of incompetence? Their history of service delivery has been less than stellar. Many political office bearers elected by "comrades" have proven totally incapable of performing their duties with ability. Appointing a business person to high office may just be what the ANC needs to inject a new level of skill into governance, or it may be the first tolling of the bell for the ANC as a dominant party in South African politics.